Audio Research GSi75 review | What Hi-Fi? High-end hi-fi purists tend to frown upon the concept of integration. Multiple boxes, each dedicated to an individual task have long been promoted as the way to get the best sound. Such thinking ends up with some fabulous sounding systems, but also a box count that could easily reach into double figures. If you want all the quality without the quantity, Audio Research’s new integrated amplifier, the GSi75, might just be the answer. This single unit – admittedly the size of a baby hippo – packs pre and power amplifier sections, a MM/MC phono stage, fully specified digital-to-analogue converter and a carefully considered headphone amp circuit. While such a collection of features would be standard at budget price points, at this level, it’s unusual enough to get us worried. Can a company, even one with the obvious skill and standing of Audio Research, combine all these elements and still turn out an amplifier that can challenge, let alone better, the purist multi-box alternatives available at similar money? We should have faith in Audio Research. The company has a fine track record with its integrated amplifiers, and every one we’ve heard from the CA50 back in 1997, has been good. This is a fully-valve powered integrated amplifier. It uses two 6H30s and four of the fashionable KT150 output valves. With a bit of care these tubes will last for around 3000 hrs before needing replacement. Changing a valve involves removing the amplifier’s protective cage, but otherwise is as simple as changing a light bulb. Setting up and maintaining the valves is simple thanks to a bias system that’s as easy to use and adjust as any we’ve come across. The KT150 valve has become popular at the high-end of the market thanks to its combination of finesse and power. The quartet in the GSi75 produce 75W per channel, which is pretty healthy by valve standards, and capable of getting some decent volume provided a bit of care is taken over the partnering speakers. As with most valve amplifiers, this Audio Research gives the user the choice of two speaker outputs – 4 and 8 ohms – to help with matching. We got some fine results with Sonus Faber's Venere S floorstanders, and provided we don’t push the volume level too high, even our usual ATC SCM 50s (with a relatively low 85dB/W/m sensitivity) sound right at home, if perhaps just a touch lightweight. There’s a pleasing incongruity about having a cutting edge digital-to-analogue circuit in an all-valve amplifier. The module fitted here has the usual USB, optical and coax inputs and can cope with sampling rates of up to 384kHz. There’s also the option of upsampling any input signal to either 352.8 or 384kHz (depending on the original sampling rate), which is well worth taking up. DSD, in both single and double speed forms, is also on the menu. The GSi75’s phono stage is almost as accommodating. It, like the DAC section, is easily adjusted via the nicely shaped metal remote. There’s a choice of high and low gain settings – 45dB or 63dB – which should be enough to cover most cartridges on the market. There are also five impedance settings to optimise the performance. And it can all be done from the comfort of your listening position. For those not into vinyl there are three single-ended line level inputs, which should be sufficient for most set-ups. Oddly, there isn’t a balanced option, which is something we’d expect to see at this level. Overall build is as we’ve come to expect from Audio Research. Products from this brand have always favoured a lab equipment aesthetic coupled to a solid, no nonsense approach to build and finish. There’s little aura of luxury here, just the feeling that with a bit of care this thing will still be working decades from now. Once up and running the GSi75 is as unfussy as valve products get. Bar the need to give it a minute or so to stabilise after the initial power-on, there’s little here to faze those more used to transistor designs. You’ll need top quality sources to get the best out of it. Paying car prices for an amplifier then taking shortcuts with source and speaker quality is a waste of money. We use our reference Naim NDS/555PS streamer and Clearaudio’s Innovation Wood turntable as the main sources, coupled to an Apple MacBook Air (loaded with Pure Music playback software) to test out the USB input. We complete the system with Sonus Faber’s Venere S floorstanders and our usual ATC SCM50 as speakers. It doesn’t take long to realise that the GSi75 is a terrific performer. Within the limits of its 75W per channel output, it delivers a wonderfully expansive sound that flows well beyond the outer edges of our speakers. It’s a presentation full of delicacy and texture, delivering the likes of Debussy’s enchanting Clair De Lune with poise. We’re struck by the amplifier’s excellent low-level dynamics and the coherent way it ties the frequency range together. The piece’s lovely melody flows with grace; each note defined with precision tinged with a hint of sweetness. Tonally things are spot-on. If you’re after the stereotypical smooth and rich valve sound this isn’t the box for you. This Audio Research is far more about neutrality. It doesn’t emphasise any particular part of the frequency range, preferring a more even-handed approach to music replay. Rather than just sounding nice – something many valve designs actively aim for – this one majors on insight and agility. It reveals the harmonic richness in the sound of a piano and renders it with a subtlety of dynamics that’s hard to match at anywhere near this price. We change the mood with the hard charging The Hand That Feeds by Nine Inch Nails. The GSi75 is happy to shift gear, and the result is a fast, punchy sound rendered with a surefooted rhythmic framework. 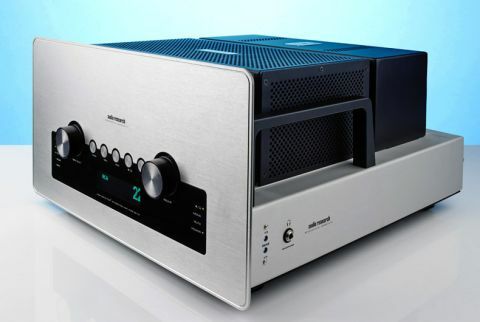 The low-end isn’t as authoritative as that delivered by similarly priced pre/power combinations from Mark Levinson, Gamut or Burmester, but it’s a match for any of them as far as information, agility and liveliness are concerned. There’s plenty of composure here too, which make it easy to follow individual musical strands even when the piece gets complicated. Switching from the line level inputs to the digital shows that the built-in DAC is a terrific performer. There’s little obvious loss in transparency between the analogue and digital sections, which is a major complement to the number crunching module. Through a range of music, from Bruce Springsteen and Stevie Wonder to Arvo Part and Olafur Arnalds, the Audio Research impresses with its finesse and detail recovery. It’s a wonderfully open and transparent performer that simply gets out of the way leaving the music to take centre stage. Headphone users aren’t short-changed either. Audio Research has done well here, managing to deliver the same high standard we heard through the speaker outputs. We enjoy the likes of the BeyerDynamics T1 Gen.2s and Sony’s MDR-Z1R without issue. We’re less taken with the phono stage. It’s a decent performer, one that’s perfectly acceptable for occasional use, but falls short of the sky-high standards set by the rest of this amp. Its presentation is less lively, lacking the clarity and enthusiasm that makes the rest of this design so addictive. While we would see no point in adding an external DAC, even a high-end one to the GSi75, we would splash out for a good outboard phono stage, if vinyl replay were a priority. That’s as negative as we’re going to get. We’ve fallen for this amplifier, big time. It can stand toe-to-toe with the finest pre/power combinations at this price, yet comes in a single chassis and is packed with useful features most of them lack. Hear one in full flow and be prepared to fall in love.